We loved being a part of Matt & Julie’s Willow Oaks Country Club wedding in Richmond, Virginia! The moment we met them, we just knew we were a great match. We loved getting to know them during the whole process! When clients become friends it’s the best part about this business! It’s so important to us to build a strong relationship with our couples, it’s so vital to be able to capture the wedding day in a genuine way. When we arrived to capture them getting ready, both Matt & Julie were pretty calm, but excited! Their entire bridal party was so laid back and they were having so much fun. I loved capturing all of Julie’s bridal details from her jewelry to the lace on her dress. Matt looked very handsome in his blue suit! Once they were ready they did a First Look! First we had them hold hands around the door and then they did the full look. Their reactions were so wonderful to capture. It was a little chilly for their March wedding but they were so glad they were able to have their outdoor ceremony! The shawls for the girls were the perfect touch. Their officiant was an old friend of Julie’s dad, so that was very special to have him there to marry them. During the ceremony, a groomsman read, “First Day of my Life” by Bright Eyes. Julie & Matt wrote their own, very thoughtful, vows to one another. It was truly one of the most beautiful ceremonies we’ve witnessed! After the ceremony, we went on a golf cart adventure down to the river! It was cold but sooo worth it!! Onto the reception! Matt & Julie danced to “One Call Away”. 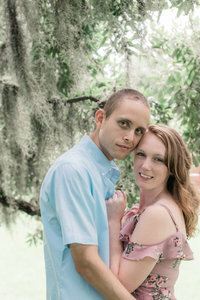 If you don’t remember from their Engagement Session, Matt & Julie lived apart in the beginning of their relationship: Matt in Norfolk and Julie in Richmond. Julie told us that she always heard that song when she was driving to visit Matt in Norfolk! Their Father/Daughter and Mother/Son dances were also very beautiful to witness. Dinner and dessert was delicious! They had cupcakes from Pearls Cupcake Shoppe and ice cream sandwiches from Nightingale! Everyone danced it all off on the dance floor, it was such a fun group!